I enjoyed this book and my favourite character was Magnus who was very adventurous. This book was definitely realistic and encouraged me to want to find out more about that time. I would like to read more books by this author. In my opinion I thought that Anglo Saxon boy was really good and also it was really full with fun facts about their time and it made you want to keep on reading that's what a good book is about. Magnus is a very mysterious character that does not expect really fancy stuff like weapons and protective clothing unlike his two greedy brothers Godwin and Edmund, their father them what they wanted its kind of like kids taking control over their parents. They had a little sister Gytha who wasn't old enough to race into battle. Magnus was chosen over his two fierce brothers to head into battle but his dad didn't want them knowing. There were a few ups and downs along the way like barns being destroyed and people passing away. Magnus hat to go on this quest that his farther sent him on to discover the truth behind all the attacks that his uncle was involved in and when it would happen. Magnus had to pretend he was on his uncle's side because for what he witnessed was him and his farther had a falling out with each over at the dinner with all the servants and the messengers. I learnt that in the olden times they always had to fight in battels and there were possibilities that your family may not survive the battle or even win. It gives you great and fascinating information. I would definitely recommend this book because it never wants to make you put it down you cant lay your eyes off it. It makes you think that your in that battle it sends you amazing images. It has detailed illustrations that gives you a great idea of what is happening. Very creative. I rate this 5 out of 5 because its amazing scary and mind blowing. BEST BOOK EVER. 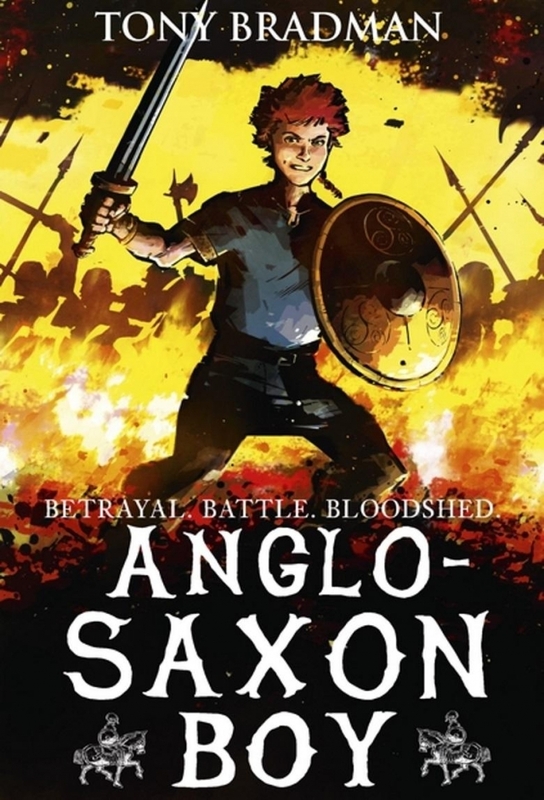 This book is about a boy who has to go and fight in a big war which has occurred in 1066 and his father Harold Godwinson is the lord of the Southern Saxons who's in line for the Throne of England. The battle is caused by a family feud between the two brothers and who should be in charge of England. The setting in this book is a large castle with large fields and crop farms around the land. The characters in this book are Harold-the father, Magnus-the main character and one of the sons, Hakon- a housecarl, Edith-the mother, Edmund and Godwin- the brothers. I have learnt that the war which had happened in 1066 was due to a family argument between two brothers over a fight for the throne. I would recommend the book to everyone and probably for the ages of 8-12. Moreover this book is the best for anyone who is eager for a bloodthirsty adventure and has a liking of History. Being a very educational yet exciting book, Tony Bradman has done a fantastic job. Furthermore the illustrations were really good and helped to portray what had been written and also make us feel as if we were there another thing is that the images were and detailed. Finally I would rate this book a 5/5. This is a good book if you like history. It goes back to 1066. It is quite magical though with lots of good words so it helps your imagination. I enjoyed it a bit because of the good words that were used. I think I would have like it more if liked history books more. This book (Anglo Saxon Boy) isn't my usual kind of book that I would have chosen to read. It took me into a world of new and different adventures that you wouldn't find in any other book. I enjoyed this magical story because it told me what happened to the heroic heroes that fort in 1066. This is a fascinating History book that I would recommend to ages above 8. I also liked looking at the maps of England. My preferred character is (the main character) Magnus because he fort for England and Denmark. I enjoyed this book because it was gory, realistic and exciting. My favourite characters are Magnus, Harold and Tostig (Harold's brother). My favourite event is the Battle of Hastings. I found the book very realistic because when I read it, I felt like I was Magnus. The book did make me want to find out more about 1066 because I want to know more about Anglo Saxon life and I would love to know about more battles that the Anglo Saxons fought in. The book made we want to read more books by the author because I liked feeling as if I was in that period of time. Magnus lives in an abbey with his family and housecarls, his life is peaceful. Harold wants to claim the throne because the king is almost dead and Magnus has to help him to do it. Harold becomes king after the old king dies. There are two battles for the throne when Harold is king. In one of the battles, the king kills his own brother because he wants the throne for himself. I enjoyed the book because there were battles, bloodshed, betrayal and death - which not all stories have. I also liked that Tony Bradman chose an event which actually happened in 1066, when the Saxons were alive. I thought Anglo-Saxon Boy was a very good book because of all its details about the Saxons and how they lived. My favourite character is this book is Magnus, because he is always up for an adventure and he decides his own path. My next favourite character is Hakon because he is ready for any battle and is a very likable character. You'll love them both! The history is this book was incredible because Magnus really existed! Nobody knows where Magus is now but the answer could be revealed. Almost everything written in this book was true. This book made me want to learn a lot more about this period in history because I would like to see how the Anglo-Saxons lived by reading many more books. I am sure you will feel the same! I want to read a lot more books by this author because he really catches you in the story by building suspense and helps you to picture the scene through details. I just thought this book was amazing and I am sure you will feel the same. If you want to know about Magnus' life and whether everyone survives the famous battles of 1066, then you will have to read this book! This hasn't been my favourite book but I did enjoy it. I particularly liked the Hakon. There is lots of realistic history and I would now like to learn more about the Anglo Saxons. Although I recommend this book to others, it wasn't really the type of book that I usually read myself. I enjoyed the book because it was about 1066 which is my favourite part of history. In the book I really liked the character of Magnus Godwinson as he has my name! I thought that the history in the book was realistic, especially the conversation between Tostig and Harold. The book did not make me want to find out more about the history as I feel that I know enough, however, I think that Tony Bradman is a very good author. Earlier this year, French President Emmanuel Macron announced that the famous Bayeux Tapestry was going to be exhibited in England in a few years time. This will be the first time that the tapestry will have been outside of France in its 950 years of existence. It is the most famous tapestry in the world and the most famous part of it describes the death of King Harold (with an arrow piercing his eye) in the infamous Battle of Hastings in 1066, the last time England was successfully invaded. This book, then, comes at the ideal time because it tells the story of 1065, focussing on the life of Magnus Godwinson who is the son of King Harold. It is a book of historical fiction which is very atmospheric and which transported me back to the Godwinson home as the Battle of Hastings loomed. The most memorable part of this book was when Magnus and Hakon (King Harold's most loyal follower and warrior) went to spy on Tostig. Tostig is Harold's brother and he is in exile because he had let down his kingdom. Harold does not trust Tostig at all and fears that tostig will try to raise an army and overthrow him. He sends Magnus (who he wants to be his heir) and Hakon to found out Tostig's plans. I found this the most memorable part of the book as it was about meeting many great wartime leaders of that time and therefore, it informed me about that period of history. Magnus needs to pretend that he is not on his father's side in order to trick Tostig into revealing his scheming plans. It was exciting watching Magnus try to keep up the pretence as he remembered his task here was to find out what Tostig had in mind. I thought he would give himself away which made it tense and interesting. My favourite character was Hakon as I liked his loyalty to Harold and Magnus.Â In the story, there were many parts where he could have just left Magnus to die. However, he was loyal and did as he was told and eventually died for Harold Godwinson as he said he would in his oath. As he raced into battle, he screamed 'I have an oath to fulfil...Live long, Magnus'. I really admired him as he sacrificed his life for others. The most interesting setting in the book was York as most of the exciting parts happened in or around it. I have recently visited York and it was amazing to see how much difference 952 years can make!Â The event in York which I liked best was the battle against Tostig, Hardrada (the Viking king) and his Viking companions. The battle was very gory and both sides suffered heavy losses.Â Tony Bradman does a very good job of recreating this battle but if you don't like buckets full of blood this might not be the book for you. I, though, love a bit of blood and gore so this was great for me! The history in this book is very believable, as it sounds like what Anglo-Saxon England was like, from what I know about the time. It has made me want to look up Magnus and see if he was a real person.Â There were a few moments that I found less believable like when Magnus charges out of the safety of the shield wall and manages to survive the attack of 20,000 angry Vikings. However, this is historical fiction so there are always going to be some characters and some events that are made up to make the story more exciting. This book does make me want to read more books by Tony Bradman and ˜Viking Boy' will be next on my list. I think people aged 10+ would enjoy this book greatly as long as they can cope with all that blood, all those battles and all that gore. I did not read much of this book but it was not too bad. The descriptive words were used were good but I didn't really get to know the storyline. The main problem was at the start it didn't hook you in. Overall this book was okay. Although the title and the first chapter weren't very engaging, the plot became much more captivating later on. The story follows Magnus, the son of Harold Godwinson, in the run up to the Battle of Hastings and is a novel and fresh perspective on a very well known historical event. I think that it managed to narrate a story taking place in such a different world from ours well, as it avoided overwhelming the reader with historical facts while still being accurate and interesting. There was a mix of the politics of the time, which was all very complex (even from Magnus' perspective though he was 14 and 15 in the book), and lots of fighting like at the Battle of Stamford Bridge against Harald Hardrada and Tostig (Magnus' uncle). The fighting was quite exciting and managed to seem different each time. I also found interesting what happened to the rest of Magnus' family in the last chapter and the historical note because you never really think about what the women would do. Generally, I liked the book although the beginning wasn't very captivating and it was quite long. Although the politics was a bit boring at time, overall it wasn't too bad. I didn't particularly like this book but I suppose you can't like everything. I suppose I didn't really like the blood and death side of it but that is kind of the point of the book. I also might have not liked the book because it was not what I enjoy in a book. I don't think the book was all bad because it did tell me a lot about what happened in the Anglo-Saxon time. It was also quite fascinating because there was a lot of interesting descriptions in the book about what was going on and what things looked and felt like. Overall I didnâ€™t really enjoy the book but I think the book is still very good. I would definitely recommend this book to a child that might be a bit older than me (aged 11 or 12) as I didn't understand some of the words the author used. This story is set in 1065 and follows the tale of Magnus who is the third son of Harold Godwinson, lord of the Southern Saxons. Harold wants to claim the throne of England and needs Magnus to help him discover what is happening with his enemies and allies. Magnus is 15 years old and has been chosen because he keeps his counsel and knows when to speak or when to remain silent. Magnus goes on long journeys with his companions and gets involved in family rows. He also gets involved in battles. The story leads to the battle of Hastings, which led to the Norman era. I really enjoyed this book because some parts were set in York, which I have visited. I like Magnus Godwinson because he is a very intelligent and loyal character. I thought that the historical settings were true to life and realistic. I would like to read other books by the author and further my knowledge of history.